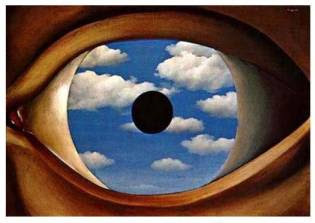 How the paintings of René Magritte inspired a writer – MIXTAPE – A compilation of personal opinions on writing, art, creative inspiration and politics from a curious old soul who lives a few decades behind. MIXTAPE – A compilation of personal opinions on writing, art, creative inspiration and politics from a curious old soul who lives a few decades behind. One of the great things about living in Chicago is having access to world-class art. The Art Institute of Chicago was recently voted the world’s best museum by TripAdvisor, and the big draw over the last several months has been the René Magritte exhibit titled, “Magritte: The Mystery of the Ordinary, 1926-1938.” When I read in the exhibit advertisement that Magritte used his work to make “everyday objects shriek aloud” and “make the familiar unfamiliar,” I wanted to go for two reasons: 1) I like art that boldly presents “ordinary” things or ideas in a different context – a context that challenges our understanding of what we accept as universal truth, and one that calls us to experience our world in new ways, and 2) I thought I could gain some inspiration for my writing. How can I present universal ideas and themes in a fresh way that challenges a reader to re-examine certain assumed truths about their lives? On the second to last weekend of the show, I grabbed some coffee and walked down Michigan Ave to the museum. The line was already out the door by 11:00 am, but it moved quickly and I was able to get my ticket and audio device and head into the exhibit by 11:30. The space had been constructed using dark paint on the walls and almost no light except for directly over the paintings. The people who know me most know that I like consuming cocktails in dark, cavernous places, so it’s not surprising I like consuming art there as well. It was easy to disconnect from city life and put myself in the world created by Magritte’s paintings. When I looked at this painting, my eye was first drawn to each object. I instinctively identified each one as bag, knife, leaf, and sponge. Then, I looked at the words under each object. With the leaf, I saw that it was a leaf, but the words below it said “La table.” Table? That’s not a table, right? Boom. I became Magritte’s puppet at that moment. Even though life experience had taught me an object that looked like the one in the bottom left corner of the painting was a leaf, just labeling it something different caused me to question, even just for a split second, an idea I would have been absolutely sure of five minutes prior. I think Magritte is forcing us to recognize that the way objects are represented, rather than the objects themselves, plays a significant role in how we categorize, experience, and interact with them (e.g. “This is not a pipe” below). 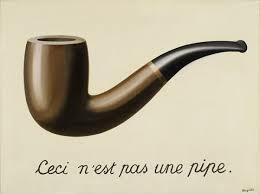 If you asked someone what this object is in the painting, they would say “pipe.” Magritte is suggesting this is only a representation of a pipe. You can’t pack it with tobacco, put it to your mouth, or blow out the smoke. It’s a representation – one that can be manipulated by changing the context. If someone asked me to envision what madness looks like, my mind would produce an image like a supernova – lots of colors, streaks, and movement. 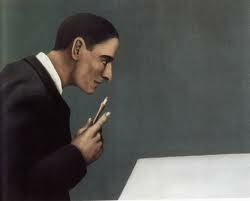 In this painting, Magritte created a feeling of madness with a man, table, pencil, gray wall, and stillness. These ordinary objects evoke a sense of madness just by the way they are represented, even though individually they are not associated with madness. Using Magritte’s Interpretation of Dreams painting as an example, if we took “man,” “pencil,” “table,” and “wall,” and put an image of each in a 2×2 frame, we wouldn’t associate these objects with madness. By changing their context in this painting, Magritte was able to produce a feeling of madness, and challenge our acceptance of what it looks like in our physical world. This painting shows the reflection of clouds in the iris of an eye, suggesting that clouds are what the owner of the eye is seeing at this moment. What isn’t accounted for is the big, black dot in the middle of the reflection. This dot represents the nonlinear and personal way individuals experience the world, even though they are taking in the same information. The objects making up the truth of our lives change based on how they are represented, and how we interpret them. I get a buzz when art exposes the vulnerability and arbitrary nature of truth. Even when we think we have it figured out, an artist like René Magritte comes along and challenges us to think again, to pick up the pieces of our existence and look at them from another angle. Applying inspiration from this exhibit to writing fiction, I think the power lies in the thoughtful use of granular details in scene building to construct and convey an “ordinary” truth in a fresh way. I am reminded to keep a wide-open imagination, and not make assumptions on what I can or cannot use in our physical world to produce an emotion. My husband’s subtle behavior modification techniques. I like his illustration of the crying door. It’s that time of year when every other post is of this beautiful Indiana sky. My pal Rudy loves it too.